With free Wi-Fi an indoor pool complimentary breakfast and HDTV it's no wonder the non-smoking Hyatt Place Jackson - Ridgeland is a favorite among our guests. The six-floor Hyatt Place hosts 126 spacious contemporary rooms with separate living and sleeping areas. All rooms also come with work desks Hyatt Grand Beds Cozy Corner sofa beds mini-fridges coffeemakers free Wi-Fi AM/FM clock radios (with mp3 docks) and 42-inch flat-panel HDTVs with premium channels. When morning hunger hits take advantage of the free continental breakfast buffet or purchase a cooked-to-order hot meal from the hotelâ? 's 24-hour guest kitchen. To boot the on-site Bakery Cafe offers fresh-baked items coffee drinks wine and beer. If it's activity you're after you'll be happy to know there's a fitness room on site plus an indoor pool. Corporate guests may want to take make use of the e-roomâ? 's complimentary access to a computer and printer. Parking is free. 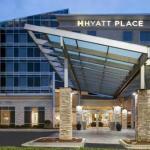 Just off I-55 the Hyatt Place is a 10-minute stroll to the Renaissance at Colony Park shopping center. Popular attractions within 15 minutes of the hotel include the Mississippi State Capitol Mississippi Sports Hall of Fame Mississippi Museum of Natural Science Jackson State University and the Jackson Zoo. Water sports fishing and miles of shoreline at Ross Barnett Reservoir are 20 minutes away. It's 17 miles to Jackson-Evers International Airport.